The High 5 is where I give my reaction to the night’s games. This includes a look at the players who made a difference in the outcome and some unique details that caught my attention. The Raptors visited the Queen City to stomp out Charlotte’s remaining playoff hopes in a Friday night revenge game. The last time these two teams met, the Hornets stole a win off the improbable heroics of Jeremy Lamb and his final second desperation heave. That win is starting to look like the biggest victory and high point of the Hornets season as they are all but eliminated from playoff contention. The talk around the Raptors these days is how Toronto has suddenly become one of the most unselfish and accurate three-point shooting team in the league. Many are attributing this drastic change to the ever-improving integration of Marc Gasol and the impact he has had on this roster. Other’s may cite that the Raptors are finally at full health or that players are locking in as the playoffs near. Regardless the reason, Toronto has shown that they can play at an incredibly high level and when everything is clicking, they look damn near unstoppable. Though many believed that the game was decided before the tip, the Hornets were looking to change the narrative. 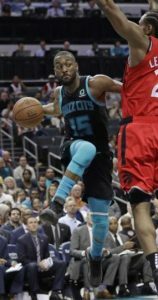 Charlotte fought valiantly throughout the game while Toronto was fueled by a strong defensive effort, gorgeous ball movement and surprising physicality. 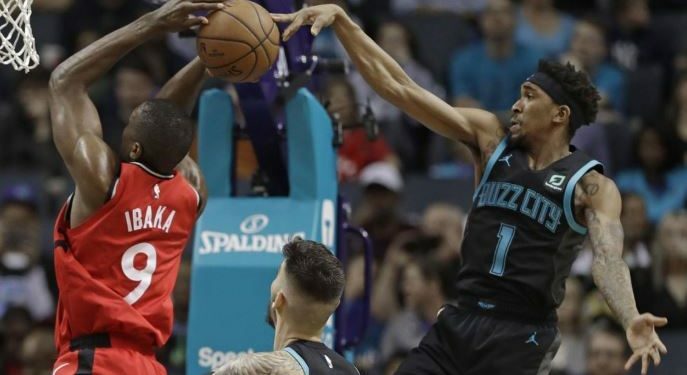 Jeremy Lamb showed that he had a few more tricks up his sleeve while Kemba Walker led a spirited charge to prove that the Hornets still had life left. The game came down to the wire but finished in anti-climactic fashion as Kawhi’s last second attempt wedged between the rim and the backboard ending the game with a resounding thud. 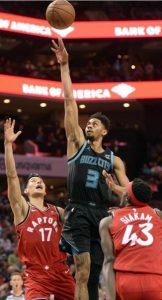 Jeremy Lamb was the hero once again and has started to develop a reputation as a Raptor killer. The Hornets deserved the win, but they may have only been delaying the inevitable. Kyle Lowry is playing with such invigorating energy that it feels as if it bleeds through my television screen. Tonight, Kyle was a savant with the ball, he threaded his passes with the precision of a tailor. The shooting woes that plagued him earlier in the year seem like a distant memory as he has once again assumed the role of a knock down shooter. The most intriguing part of Kyle’s game is how much more complex and intricate his passing has become; how clever his playmaking is and how well he can maximize the talents of those around him. Lowry had 16 points, 5 rebounds and a game high 11 assists. Kyle has not just increased his play, he has increased the quality of his play, which has created a ripple effect and elevated the game of his teammates. Jeremy Lamb is a frustrating talent. He reminds me of a young Terrence Ross when he played for Toronto. A player blessed with athletic gifts and a smooth jumper but somehow unable to put together enough consistent play to be relevant in the league. That is unless Jeremy is playing the Raptors. For some reason, Lamb has some of his best games against Toronto and has twice come up with game winning jumpers against them to the shock of everyone (including himself and his teammates). Jeremy ended his night with 22 points to go with 5 rebounds, 4 assists and 3 steals. Lamb stumbled his way to a great night when his decent game was bolstered by his unlikely heroics. The silent assassin was at it again with another deadly shooting night. Kawhi Leonard has been magnificent as of late leading the Raptors on both sides of the court. The Raptors were sputtering with time running out until Kawhi said that’s enough of that and proceeded to take over. Kawhi’s efficiency was off the charts as he shot a staggering 12/18 from the floor. He finished with 29 points, yanked down 6 rebounds and dished out 4 assists to round out his game. Kawhi almost pulled off another clutch performance but his late game efforts fell short. Despite the loss, Kawhi looked fresh and strong validating Toronto’s commitment to load management. 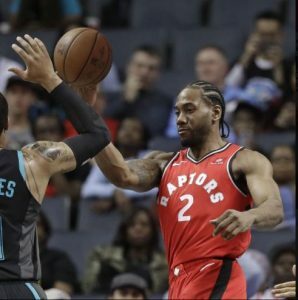 People can talk about Green’s shooting, Serge’s defense or Siakam’s dynamic play, but Toronto’s most dangerous weapon is a healthy Kawhi Leonard. Serge Ibaka is finally starting to develop the same type of chemistry with Fred VanVleet that he has with Kyle Lowry. He and VanVleet have unlocked the “pick and roll” secret as Fred was feeding Ibaka all night. Serge exploded in the fourth quarter with an assortment of jumpers, pump fakes, leak outs and devastating hammer dunks. He was scaring the Hornets away from the rim with his long arms and visceral war cry. Serge went 10/15 from the floor for 20 points to go with 12 rebounds, 2 blocks and an assist. Ma Fuzzy Chef was automatic from the midrange and went deep into his move list for an impressive night from the paint. I hope Charlotte appreciates the generational talent that they have in Kemba Walker. He is the perfect combination of skill and flash. He never looks out of control, he makes sound decisions and he always plays with poise and balance. I can only imagine how much brighter his star would be shining (and it still shines bright) if he was in a better system surrounded by better talent. Tonight, Kemba did it all as he did his best to will his team to victory. He matched Kawhi’s night by scoring 29 points while adding 6 rebounds and 8 assists. I have nothing bad to say about Kemba’s game as he really is one of the most polished players in the league. Kemba Walker played like an All Star tonight. Buzz City – The Hornets could sure use a lift from their crowd. This team is fighting to stave off elimination against one of the best teams in the league and yet the Charlotte faithful remained seated on their hands for most of the game. Finishing strong – I no longer trust OG to avoid violent contact on contested dunks. He has had some ugly looking collisions that could have easily led to another stint on the injured list. Someone needs to work with him on finishing through contact. Mid-Ranger– Kawhi missed 4 shots tonight all from behind the arc. He made all 12 of his shots from within the three-point line. Next up for Toronto is an early Sunday afternoon matchup with the Miami Heat. The Heat are also fighting for their playoffs lives so I expect them to come out with their best effort. The Raptors will need to be ready because Miami will be hungry. Dante has been following basketball since Latrell Sprewell’s been collecting rent. His love is reserved for those who put in the work and prove that nothing is given; everything is earned. Dante puts focus on the details of basketball – the growth of a player, year to year improvements, efficiency on the court and professionalism off it. All the while, Dante will be evaluating on the decisions of the franchise, the direction of the team and reporting on the results. Dante offers a unique opinion that will not only capture the basketball content but also the human element of the Raptors throughout the season and into the playoffs. Canada vs. USA – FIBA Americas Championship. WATCH LIVE!